This model runs in OpenCell and COR, and the units are consistent throughout. The current model only describes a single RyR gating scheme, while the paper tests different gating schemes coupled with other dyadic components to recreate ion flows. As these are not described in great depth, this model is likely to remain incomplete and unable to recreate published results. Initial conditions used here are guesses. ABSTRACT: In cardiac muscle, release of activator calcium from the sarcoplasmic reticulum occurs by calcium-induced calcium release through ryanodine receptors (RyRs), which are clustered in a dense, regular, two-dimensional lattice array at the diad junction. We simulated numerically the stochastic dynamics of RyRs and L-type sarcolemmal calcium channels interacting via calcium nano-domains in the junctional cleft. Four putative RyR gating schemes based on single-channel measurements in lipid bilayers all failed to give stable excitation-contraction coupling, due either to insufficiently strong inactivation to terminate locally regenerative calcium-induced calcium release or insufficient cooperativity to discriminate against RyR activation by background calcium. 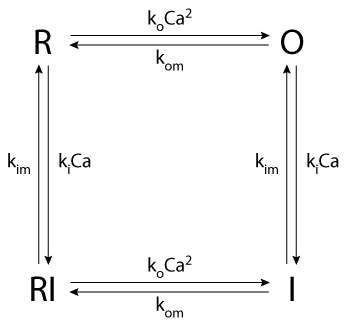 If the ryanodine receptor was represented, instead, by a phenomenological four-state gating scheme, with channel opening resulting from simultaneous binding of two Ca2+ ions, and either calcium-dependent or activation-linked inactivation, the simulations gave a good semiquantitative accounting for the macroscopic features of excitation-contraction coupling. It was possible to restore stability to a model based on a bilayer-derived gating scheme, by introducing allosteric interactions between nearest-neighbor RyRs so as to stabilize the inactivated state and produce cooperativity among calcium binding sites on different RyRs. Such allosteric coupling between RyRs may be a function of the foot process and lattice array, explaining their conservation during evolution. Derived from workspace Stern, Song, Sham, Yang, Boheler, Rios, 1999 at changeset 91ff987c1a4b.